Bone Gap is a book that was brought to my attention because of its cover and title. The premise is interesting, too: a town filled with gaps (whatever that means) and a story somewhat centered around a girl who mysteriously disappeared. It's also magical realism--a genre I am very, very unfamiliar with. But I like creations of the imagination and I like interesting stories, and I was looking for a book to top my end of the year list, so I read Bone Gap. And I don't know what I read. 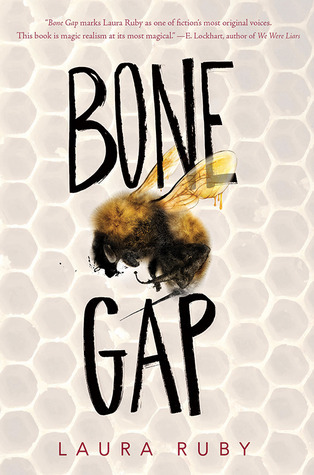 Bone Gap has garnered a lot of praise, and it's a National Book Award finalist and it won the freaking Printz for Excellence in Young Adult Literature--which is fantastic. But I won't lie when I say that all the love and awards this book is receiving has me scratching my head. I don't get it. I think the problem is that I don't get magical realism. I don't know where the line is between real and not real; it's too blurry. I can't tell if I entered a different world and I'm just in the head of an unreliable narrator. I do. not. get. it. I guess I could see how Bone Gap is a good book--I mean, I wouldn't say it's bad at all--but I almost found it boring. There were different points of view and bits in the real world and bits in some other world and things that I couldn't discern as real or not real, and the book ended up being, well, just a book. I don't know if the main character/protagonist is Finn or Roza. I would say it's Finn, but so much of the story centers around Roza's disappearance. (Because of spoilers, I won't say much else about Roza.) And the only characters I really cared about--the only characters who were interesting, really--were Finn and Petey (the latter of which is where the bees come in) and animals. There was Miguel and Sean and Charlie Valentine and the town bullies and the meh cop, but they were kind of just there: I didn't dislike them, but I didn't necessarily like them, either. At least Finn and Petey were unique and had somewhat oddball-like qualities--they were definitely the town outsiders--that made them interesting. And I liked their romance, even if I wanted to see a bit more from it. But after that...I just don't know. Needless to say, I'm a bit of a black sheep when it comes to Bone Gap. If I had a better understanding of magical realism and was familiar with how it worked, perhaps I would've had better luck with this book. But as is...gosh, I just don't know. It's not like anything about it was bad--the writing or the characters or the plot--but it just didn't do anything. It's like a story within a story within a story and I couldn't tell what parts belonged to what story, what I could touch and what was just a figment of the imagination. Bone Gap. It's just...there. Would I reread it? Maybe if I better understood--and liked--magical realism. Would I purchase it? I'm fine without it. Who would I recommend it to? This is a book for people who like magic mixed in with realism, quirky characters and crazy stories, and books other people have deemed hard to put into words. Great review. I liked this one, but I didn't love it. Probably because it had me scratching my head the same way. It was confusing. I read it last April and I'm still trying to figure out what happened. Yeah, magical realism is a style that some people seem to love, and everyone else is just confused by. I am usually in the group of confused people! I have had books with magical realism elements work for me before (like Garden Spells by Sarah Addison Allen) but I think there must be some method to their madness in order for it to do so. If it's really just all over the place and there's no good explanation for what's going on, I just get annoyed and frustrated. It's like having a dream where weird random stuff happens all of a sudden, only in a dream I don't question it – when I'm reading, I do! I think I said this book left me "unsettled" so you are not alone. I thought I was dealing with unreliable narrators, but then there was magic, and I just didn't get it. Easy to read. Interesting. But too weird for me. I often think award committees favor the weird. I can't say that I'm the one in a group of people that are totally in love with such a genre, though this one seems to me quite interesting. I'll definitely read it.